It's important to buy age-appropriate toys for kids throughout their lifespan since children learn new skills and show different interests during different stages of development. Finding an age-appropriate toy means finding a toy that is a good match for their age, interest and the skills they are learning. It is also important for safety when children are young, so they are not exposed to toys that are too small which could result in a choking hazard. Baby toys at this stage will stimulate the senses, particularly the senses of sight, sound and touch. Baby toys are colorful, textured, easy to hold, and often make noises. Rattles, bouncer seats, playmats, teethers, soft toys, and sleep toys are some of the best age-appropriate toys for babies. A baby in the 6-12 month age range is engaging more through laughing, babbling, sitting, rolling, crawling, pulling to stand at furniture, and may be very close to taking their first steps! Age-appropriate toys for babies at this age include cause and effect toys, which are often battery operated toys that play music or complete fun actions with the push of a button. Babies at this age also start dump and fill play, putting large toys in and out of containers. Toddlers at this stage are full of energy, eager to explore everything around them. They love all kinds of physical activities like pulling, pushing, lugging, knocking down, emptying and filling. Toddlers are curious​ and enjoy touching and investigating everything they see. It's a wonderful age to learn, explore and discover. Age-appropriate toys for toddlers are musical toys, outdoor toys, ride-on toys and simple construction toys like building blocks and puzzles. All of these toys encourage toddlers to release their energy and improve their fine motor and thinking skills. Preschoolers love toys that stimulate the imagination and offer a challenge. Innovative use of technology in toys has ensured hours of fun for this age group. Age-appropriate toys for preschoolers include a wide range of choices like simple board games, bikes, arts and crafts activities, construction toys, educational tablets, and pretend play sets that feature their favorite television characters. Kids in their early elementary school age years are very curious, want to explore, invent, create and conquer. The holidays are magical. Age-appropriate toys for elementary school age kids allow them to use ​their imagination, but many still enjoy dolls, superhero action figures, tablets, and board games. Children grow up so fast, don't they! 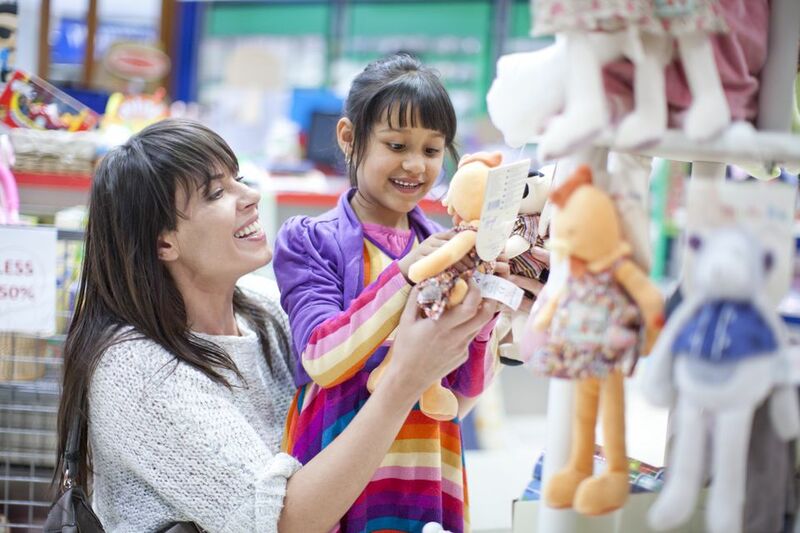 Age-appropriate toys for kids 9 to 12 allow children to demonstrate their personality. Kids love playing fast-paced games, learning to play musical instruments, are efficient at using tablets, like listening to music and playing silly party games. STEM toys and games that allow children to use complicated problem-solving skills to build robots are also popular. Teens often prefer electronic toys like mobile phones, tablets, and video games, but there are many other hot, new toys that appeal to them, too. It is popular for teens to want to ride electric scooters, sing karaoke with their friends, fly drones, construct LEGO sets, collect movie memorabilia, code robots to follow their every command and engage in active NERF blaster games with their friends and family.